The African Relish Café is open and firing, just in time for the busy season in Prince Albert. Our kitchen team, led by chef Camilla Comins, has created a menu that is simple and light. All perfect for balmy summer evenings. 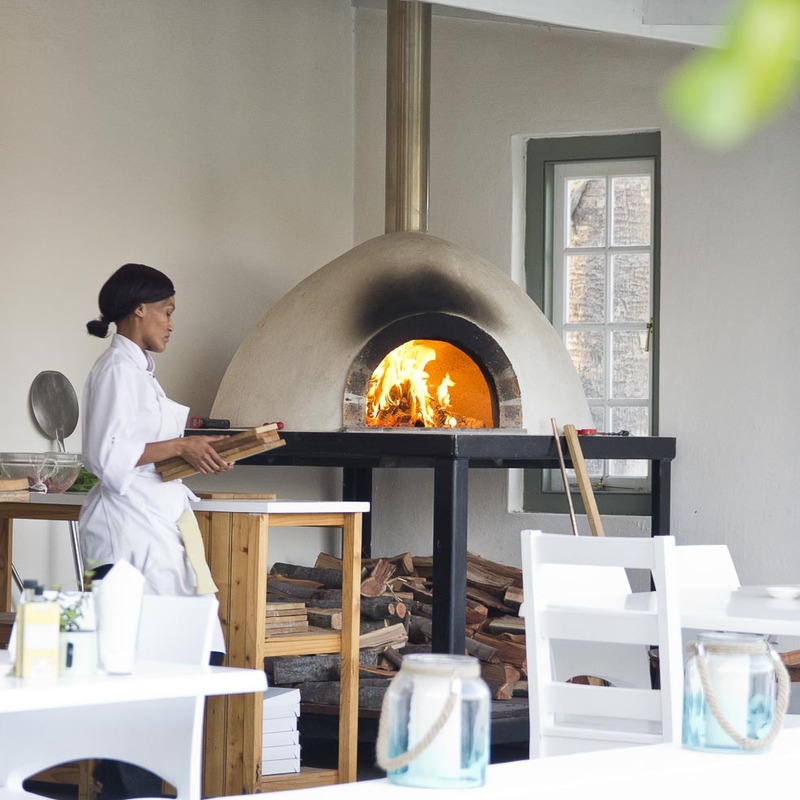 The café is set on the verandah of our historic Langhuis building, affording a view over the garden and olive grove. The east-facing aspect means that by midday the venue is in shade and protected from the afternoon heat. Just the spot for sundowners (hence the 4:00 pm opening time) or for a meal with a view over distant hills tinged pink at sunset. 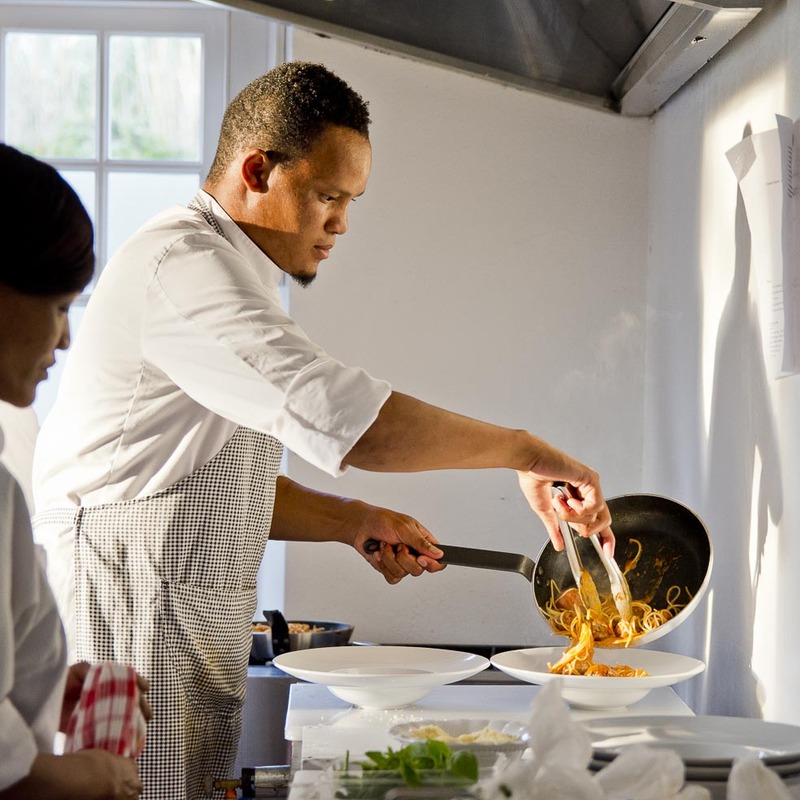 African Relish is, first and foremost a recreational cooking school. With this in mind, one of our key intentions is to train young people from the community in various aspects of the hospitality industry. With the café added to the school and our bustling accommodation division, we can provide broader experience and skills. Separating the school and the café means we can welcome visitors other than recreational cooking guests to enjoy our facilities. Choose verandah seating or a spot on the lush, leiwater-irrigated lawn from which to enjoy our cool garden. There’s space for the kids to run and a vegetable garden to explore, so it’s a great option for a family meal. Running the kitchen is Shane Jacobs, whose view from the verandah is sweeter than many of us can imagine. A little over a year ago, Shane joined the AR team to work in the garden. An exchange or two over team lunches led chef Camilla see what he might do in the kitchen. Shane was taught to cook by his great-grandmother and has proved to be a prodigy under Camilla’s guidance. He is precise and highly organised in the kitchen. 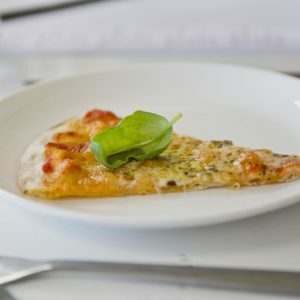 The simple menu of 5 pizzas, 2 pastas and a salad is well within his range, offering a range of options for carnivores and vegetarians. 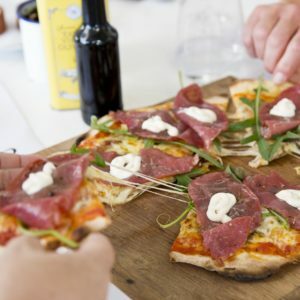 Pizzas have a thin, crisp base and range from a basic margherita to more satisfying iterations like the Pizza Relish finished with smoked kudu and horseradish cream. 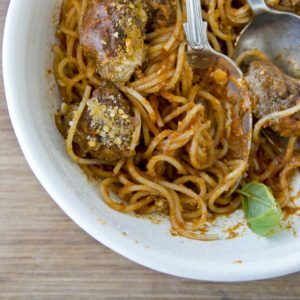 Spaghetti and meatballs is our filling and very comforting pasta offering. 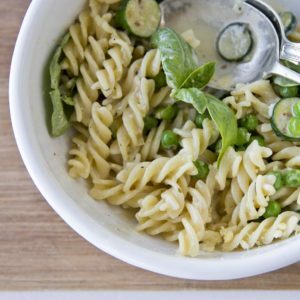 For vegetarians, there’s penne in a creamy garlic sauce with preserved lemon with peas or courgettes in season. 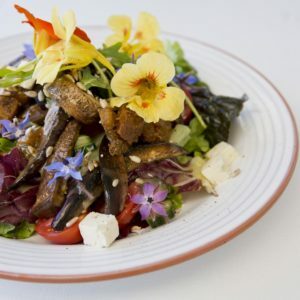 Our salad is made up of leaves in season and a selection of vegetables from our garden or those of local kitchen gardeners. Once season has passed we look forward to building on the café’s menu offering. 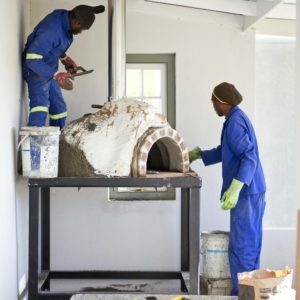 Assisting Shane, and in charge of running our wood-fired oven, is Charlotte van der Westhuizen. Charlotte started out as a sculler, but her interest in the oven and her eagerness to learn has cemented her place, pizza paddle in hand, on the café team. 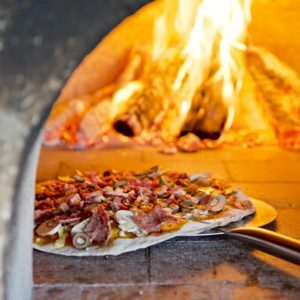 The oven is wood-fired and we take pride in running it strictly using black wattle, an invasive alien tree species. Many guests are surprised to learn that it makes the world of difference what wood is used. Apart from not wanting to cut down indigenous trees, the typical Karoo thorn tree (doringbos) is a hard wood that burns too hot. 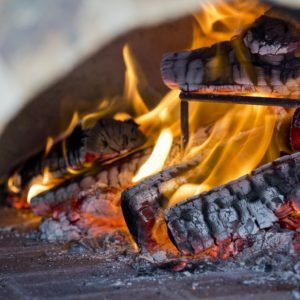 Pizza ovens require softer wood that releases energy quickly when burned. The wood of wattle trees that choke riverine systems in the country provides perfect fuel. It ignites quickly when dry and has the added advantage of burning with a tall, bright flame so Charlotte can see what’s what in the oven when she is baking pizza. A recent AR Facebook post revealed that the operating temperature of the oven is between 375°C and 400°C. A couple of friends called to point out that there was a typo in the post. Thanks all for your concern, but the temperature stated is correct. 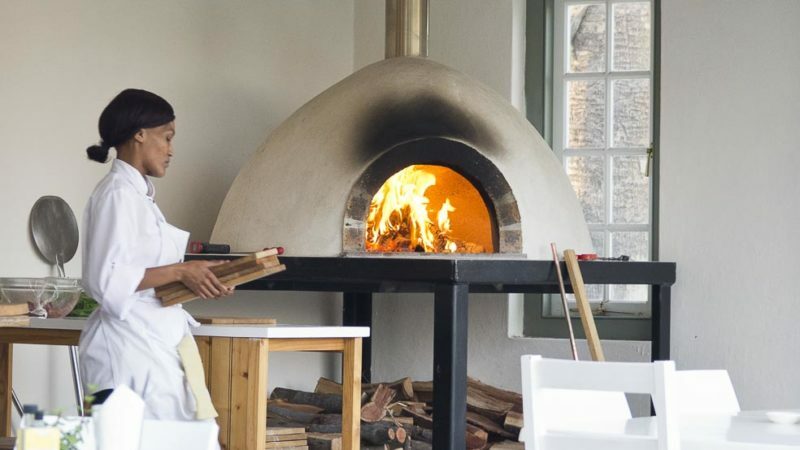 It’s a very precise thing cooking pizza at that temperature, as it cooks in under two minutes. Lucky we have a genius at the oven door. 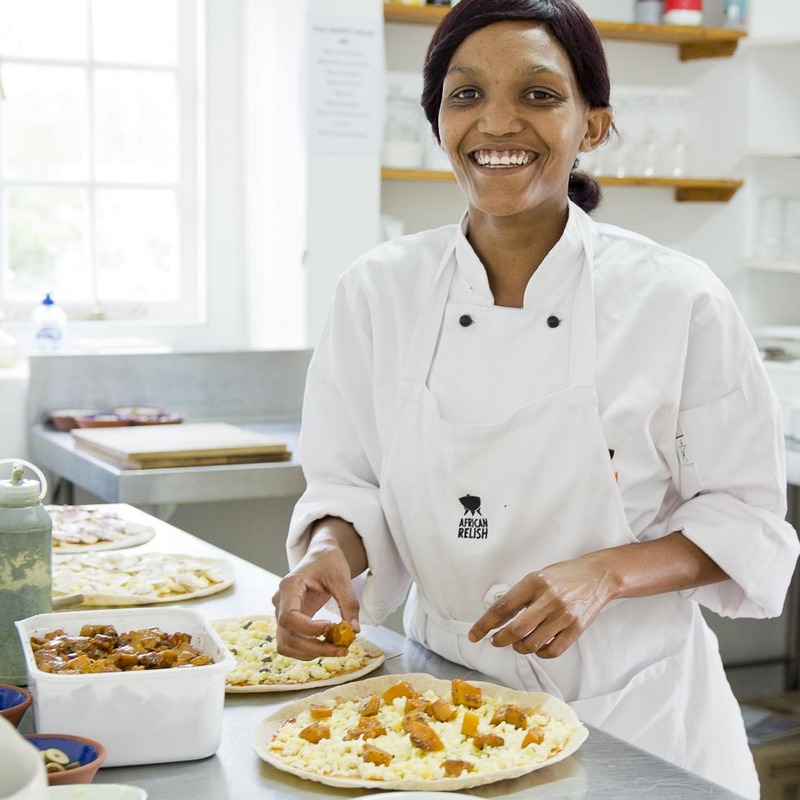 Charlotte may be the only team member with a license to drive Darin’s robust pizza oven, but the African Relish Café is licensed to offer more. 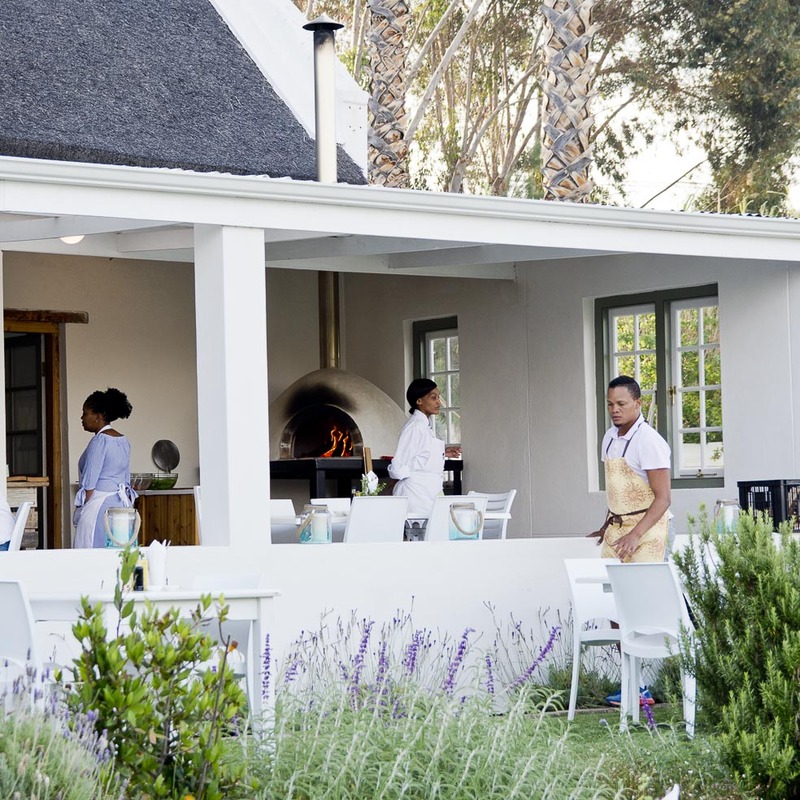 We have a full liquor license, so that sundowner on the verandah can be a local craft beer, an excellent South African wine, or even a gin flavoured with Karoo botanicals. See you in the African Relish Café this summer.